Oxydane is an advanced, high quality, daily supplement, originally designed for the sport horse but now recognised to be beneficial for every horse and pony. It promotes performance, recovery and focus, as well as supporting immune function, hoof, skin and coat health. With it's unique formula, it ensures that your horse is receiving all the daily nutrients necessary to be as healthy as possible. Oxydane is a comprehensive daily supplement that can make a dramatic difference to horses & ponies alike, who are not receiving the nutrients they need from their feed. As well as addressing basic nutritional needs, Oxydane is designed to help improve exercise tolerance and promote a comfortable and quick recovery. 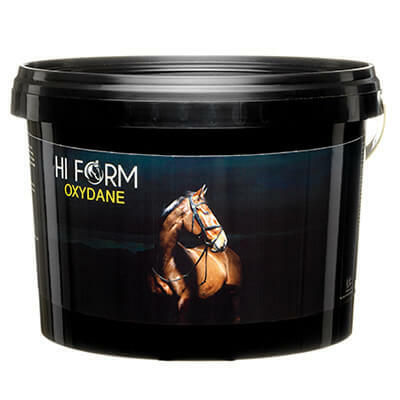 Oxydane is a completely unique formula with 36 natural ingredients and over 60 active ingredients, which all work synergistically to support your horse from the inside out. Mineral Tissue Salts - A comprehensive blend of essential minerals salt. Salts provided in this form are less irritant to the gastro-intestinal tract, more easily absorbed, and are required in far smaller quantities. Amino Acids - All essential amino acids are provided in a highly absorbable state. Beta-Alanine is also present, supplementation with this amino acid has been shown to delay the onset of neuro-muscular fatigue. Omega Oils - Omegas 3,6 & 9 provided at the correct ratio. Daily electrolyte needs are met by Oxydane; however, if your horse sweats excessively we suggest additional electrolytes are still fed.